At the start of the year I made a reading resolution for myself to pare down my TBR list. I don't need to explain to people on this site what a bane they can be; we all would like one that is more a reflection of future reading intentions and less an expression of hopes never to be realized. Back in January I had 120 books on my Goodreads "to-read" list, which is my primary metric for my TBR (it contains the books I want to read but don't own, plus unfinished books that I need to get back to at some point). I immediately set to work on it by reading Eleanor Flexner's Century of Struggle, which I then followed up with Robert Seidensticker's Future Hype and Gijs Mom's The Electric Vehicle. I also pared down the list by removing a few titles that, upon further reflection, I decided I didn't want to read after all. Since then my progress has admittedly flagged, but I still expected that I would at least be closing in on double digits by the point. The explanation is one with which we're all familiar: no sooner do I remove one book than I find another to take its place. Fortunately there's still five weeks remaining in the year, and with a lot of my short-term reading obligations addressed I plan on spending some of my remaining time paring it down some more. 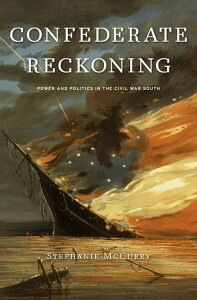 I'm starting with Stephanie McCurry's Confederate Reckoning which, if I can get it in time, I can read to fulfill my goal of brushing up on the subject prior to covering it in one of my courses this semester. I'm also going to snag a couple more through Inter-Library Loan that I can read in preparation for next semester, which will also help move them off, or at least help me to determine whether I want to read them at all.